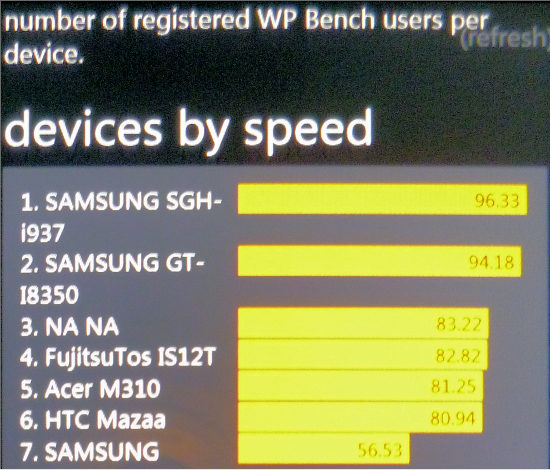 According to the latest leader board in the benchmarking app WP Bench the Samsung SGH-i1937 (AKA the Samsung Focus S) is the fastest Windows Phone 7 handset so yet, and also the fastest of the new generation of Windows Phone 7.5 handsets. The Samsung Focus S is powered by a 1.4 Ghz Snapdragon processor and likely uses NAND memory, rather than microSD card storage, which tend to slow things down. Of course we need to bear in mind that WP Bench data can be easily falsified, so we should take anything which turns up there with a massive pinch of salt, but if it does turn out to be true we would not be too surprised. Thanks Andrew for the tip.